The sink is one of the most important parts of our kitchen that we use every day, perhaps more than we use our stove or our oven. This is because we don’t just use the kitchen sink for and when cooking, but also while washing the dishes, cleaning up, washing our fruits and vegetables, filling our glasses and jugs with water, or even for washing our hands before eating. The kitchen sink, the faucet, the drains, the pipes – these are all very important parts of our kitchen that we don’t really pay attention to. This goes especially for the kitchen faucet. This is something we use multiple times every day but never really think much about. There are actually dozens of types of faucets that are available in the market, each with their own features, advantages and disadvantages. If you are buying a new faucet for your kitchen sink, upgrading or changing your old one, or completely changing the look of your old-fashioned sink, you need to know about all the options that you have, i.e. the different types of kitchen faucets that you can have, their uses and advantages (and disadvantages), and the one you need for your kitchen. Before everything else, you need to know all the parts of a kitchen faucet and their function. The supply is the main connection between the house’s main hot and cold water connection to the faucet. The body blends the cold and hot water, or keeps them separate, and takes the water from the supply to the sprout. The valve control reins the flow of water as well as the temperature of the water. The sprout is the part that delivers water from the body to the aerator. An aerator is the hole from where the water comes out; it maintains the flow of water and makes sure that the water doesn’t splash. The handles open and closes the water supply, and maintains the water flow. Now, for the different types of kitchen faucets. You can distinguish between types based on the body type, handle type, sprout type and mount. A single-hole faucet has one handle and one sprout hole, with a simple sleek body. Hot and cold water comes out mixed together from the one sprout, controlled by the single handle that operates in both directions. A two-hole or bridge-type faucet has two handles and two valves – one for hot water and one for cold, and one single sprout that the mixed water comes out of. A three-hole or widespread faucet has a bridge-like connection under the faucet, hidden under the countertop, where the hot and cold water is mixed, and comes out of a single sprout. Single-handle faucets only have one handle, usually on the right, that operates both ways, one for hot water and one for cold water. You need to fine-tune the handle to get the severity of hot/cold water that you need. Two-handle faucets, of course, have two handles, one on each sides. One handle is for hot water and the other for cold water, and you have to use both to get normal or lukewarm water. A straight sprout is low, somewhat like the ones we use in our toilet sinks, that hang low over the sink. A Gooseneck sprout is high and bending, named so because they look exactly like the tall and elegant necks of a goose. These faucets are more common in the kitchen sink because they make it easy to wash or fill a large stockpot under it. A Shepard’s Crook faucet has a special design unique to kitchen faucets with a little upward curve from the aerator to the body. This small curve gives some extra space to pile on dirty dishes or to fill a large pot from under it. Articulating sprouts can be bended in multiple places so that you can point it in any direction or angle you want, wherever you need water. Pull-out sprouts come with a retractable sprayer instead of a fixed sprout head. This kind of sprout is easy to use to thoroughly wash your vegetables and salad greens. Hands-free faucets aren’t really very common but they are quite expensive. With these faucets, you won’t have to use your hands to start or stop the flow of water. You can control water flow with a foot pedal, or motion detection under the spout; or, you can simply start water flow by slightly touching the faucet with any part of your body. However, these hands-free faucets also come with a handle that you can use to control temperature and flow. You can mount the faucet on the counter top or on your walls, depending on the design, convenience and location. Deck- or countertop-mounted faucets are the most common ones; they are simple to install and doesn’t require drilling holes in the wall. They are more helpful because this way, all the pipes stay under the sink inside a hollow cabinet, which makes it easy to repair if needed. Wall-mounted faucets, on the other hand, are easier to keep clean because they don’t crowd the countertops. However, there is a chance of the pipes freezing if this is a particularly cold region, especially if the kitchen happens to share an exterior wall. The most common faucets used in the average homes happen to be a two-hole faucet with double handles (for hot and cold water that you can fine-tune) and a gooseneck spout. At the same time, your gooseneck spout can also come with a pull-out spout that helps to clean food and utensils better. Deck- or countertop-mount faucets are also more common in homes. If you have a high budget, you can also opt for a hands-free faucet. This helps in keeping your faucet clean since you won’t have to touch it with your dirty hands while cooking. 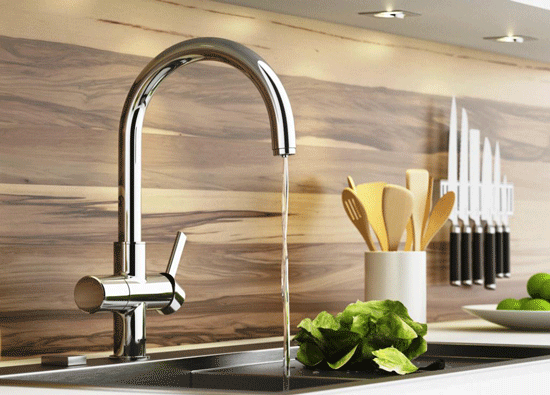 The right faucets can make your work in the kitchen faster, easier and less energy-consuming. This is not a decision that we spend much time on, while looking for fittings and furnishings of our home, but the type of kitchen faucet that we choose our home is quite important to the time we spend in the kitchen. It’s not that the wrong kind of faucet will create large problems in our life, but the right faucet can definitely make everything much better.